You heard right Grimms! My husband and I are super excited to say our family is growing. If you follow me on Twitter or Instagram then you’re already up to date on the news but I wanted to make a formal announcement here as well. A while back you guys might remember me complaining about being sick and my recovering taking some time well it turned out I was actually pregnant 😀 So I will actually be “recovering” for about nine months! This does effect the blog a bit because while I’m so excited to be pregnant I’m also really sick. The nausea is no joke let me tell you that up front. I’m also incredible tired. Making a baby is hard! You’ll notice new talk about my super long naps in Twitter and Snapchat. I’m not exaggerating them! I really take about 3 hour long naps everyday. I’m almost done with my first trimester though (only 1 more month to go as of writing this) so hopefully the nausea will die down and I’ll hs be more energy during my second trimester. With that said you never know with babies… With muy first daughter I was sick until my 7th month. I will keep chugging along on GrimmGirl though as best I can. I hope to put out at least a post a week and as I fell better I will post more often. I also hope to livestream again soon but unfortunately my camera broke! I’ll let you all know when I get a new one. Finally I have been working with a graphic designer for a logo for GrimmGirl and it’s almost finished. I can’t wait unveil everything to you all soon! I really hope you like it as much as I do. That’s all for the upcoming stuff 🙂 Thanks for all of your support! I thought you all might enjoy this picture. 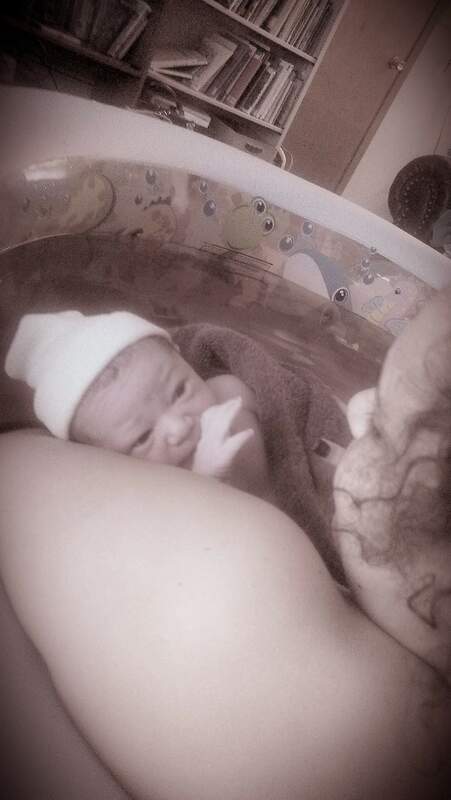 It’s a picture of my first daughter and I after she was born ❤ I did a home water birth. Which explains the pool a d the bookshelf! Woa!! I don’t know how I missed that on twitter but… CONGRATS!!!! 😱😱😱😱🎉🎉🎉🎉🎉🍾🍾🍾🍾🍾🍾yayyyy that is soooo awesome!! congrats!!! Omg you should name the baby after an anime character hahah. Also. Make sure they watch anime too 😀😀😀 so happy for you. Congrats!!! If we ever had twins I would HAVE to do Luna and Artimis like on sailor moon! Watching anime is a must in our household 😂 My daughter use to run like a shinobi with her arms back bc of all the Naruto! Congratulations. Hope you start feeling better soon and best of luck. Congratulations! We have two ourselves. In fact, speaking of blogging, my blogging actually picked up post-delivery, since I couldn’t get to sleep sometimes following those late night feedings haha. Good luck and here’s hoping you have a healthy pregnancy wiith less frequent and less lengthy morning sickness! I feel like that’s what will happen with me as well! Especially since I’ll be on maternity leave for awhile. That’s so awesome how old are your kiddos? I’m hoping my oldest does well with a new sibling. She’s four so I think ending her life as the only come might be a little hard for her lol. Yeah, it’s definitely more of a challenge for a four-year-old who knows all about the world now, and all about how great it is to have mommy and daddy to herself haha. My oldest was 19 months when his sister came along, so we didn’t have the baggage of those additional years of maturity, but we were still worried. He was a fussy baby, and needed a lot of attention and warmth from us (he still, today, deals with anxiety – something I didn’t realize he would when he was younger, but now makes a lot of sense), but he adjusted super well. I think we prepared him well and also really emphasized that bond and love between brother and sister. Today, at 9 and 7, they’re best friends. That’s so cute! My sister and I were close in age. I think it will be a bit before my kids will become real friends because of the age gap but at least for now Nadia seems excited! I’m sure Nadia will do just fine! Congratulations! Feel better soon! Luna is a lovely name.